Having hundreds of items in your bank set aside for completing treasure trail emote clues is not terribly convenient. If you want to hold onto your emote clue items, you have to sacrifice a large chunk of your bank to do so. Well - no longer do you have to choose between your love of bank space and your love of clues! Hidey holes, also known as STASH (store things and stuff here) units, are here! STASH units cannot be used in Deadman mode. Across the map you can find a whopping 108 STASH units to be built. Grab some nails, planks and head out to set up your STASH units today! The Last Man Standing beta is now accessible for players who were accepted into the closed beta program. Open until Monday, just under 2,000 players will be relentlessly playing the minigame to provide us with valuable feedback in preparation for release later this month. If you weren't invited to the beta, keep an eye out on YouTube and Twitch as participants are free to share their experience with you. Last Man Standing will be on the way to Old School in the very near future, so hold tight! 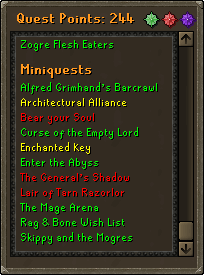 A list of miniquests has been added to the bottom of the existing quest list. This will help you keep track of your progress through various miniquests. Please note: The early display name change with bonds feature will be disabled immediately following the update as we perform some live testing. The feature will be enabled shortly after the update, once testing is complete. 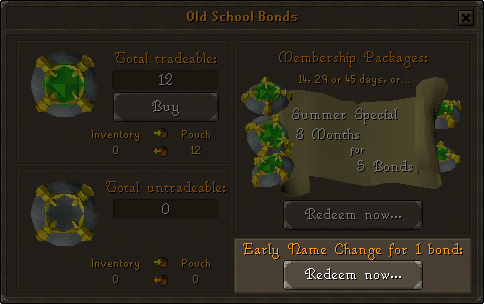 Old School bonds can now be redeemed to bypass the cooldown on name changes. If you wish to redeem a bond to bypass the cooldown, you must do so through the existing bond interface. To find the bond interface, click the settings tab and then the bond button. From here, you can redeem your bond to bypass the name change cooldown by using the redeem option found in the bottom-right of the interface. Once you have confirmed your redemption, you will need to log into the main RuneScape website and access the display name section to change your display name. You can read more in-depth instructions of how to do this in our help centre. The pothole dungeon has received an expansion! You can now head into the extended upstairs area to find many more jogres to take on. A medium clue scroll has been moved out of the Wilderness for consistency with other clues. Heraldic kiteshields and helmets will now be converted to their standard versions upon death in PvP. The amount of nightshades given when harvesting has been increased to three. 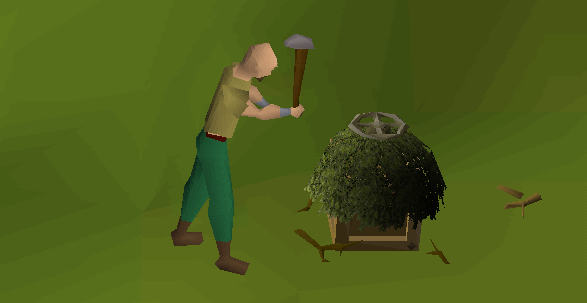 Pest Control portals will now block ranged attacks passing through them. The examine information on Ornamented Godswords has been changed to better reflect their appearance. Where possible, clue nests will now appear next to the player rather than under them. Brugsen has been moved away from the combat zone in the Grand Exchange. Clue caskets dropped by crocodiles will now be placed in the player's inventory. Fairy Nuff's certificate can now be given a bank placeholder. Fixed an issue where the lyre would show through a player's legs. Certain tasks from the Lumbridge & Draynor achievement diary can now be completed on the upper floors of Lumbridge castle. Using spellbook swap on the ancient gate in Legends' Quest will no longer cause the spellbook to remain swapped. You can no longer enter Death to the Dorgeshuun instances when skulled on Deadman mode. A stretching issue with Godswords has been fixed. Releasing toads in the duel arena no longer causes a delay. Fixed an issue where the family crest easy Falador task would not always complete first time. Resolved an issue with the herb sack and the bank. Fixed an issue where the incorrect wizard type would spawn when doing some hard clues. The clue hunter outfit can no longer be taken to Entrana. Watson will no longer take clues that he already has when offering all clues. Fixed an issue where an emote clue on the agility pyramid would not always work. You can no longer bypass a master skill challenge by dropping it and completing a different master skill challenge. A stretching issue with the Ankou outfit has been fixed. Alice's husband can now be spoken to when wearing Morytania legs 3 & 4. Fixed an issue where a small area of the Kourend Caracombs was not multiway combat. Using purple or white firelighters on inappropriate logs will now provide an appropriate message. Corrected some text when buying a Smithing cape from Thurgo as the wrong perk was listed. Fixed a spelling error on an elite clue scroll riddle. Killing ankous located in the Wilderness will now work for clue scroll tasks. Fixed an error where the wrong NPC was listed when handing in a hard anagram clue scroll. The Ring of Suffering (i) now has the correct wield requirement. Free to play players can no longer obtain the clue hunter outfit, as it is a member's item. Now that you have launched master tier clue scrolls, would master tier achievement diaries be something of interest to work on? Achieved 2277 total on August 5th 2014. Lieutenant of Ameno FC 120+ PvM Clan - PM in game for all enquiries. Now that you have launched master tier clue scrolls, would master tier achievement diaries be something of interest to work on? Certainly wouldn't rule it out forever, but I feel there isn't really room for it. The elite requirements were done with virtially no restraint, requiring 80-90+ stats and including most content. Awh.. No updates on AUS servers. Anything to report?